Jajarkot –Illicit cultivation of opium poppy is gradually flourishing in the Nalgadh Municipality in Jajarkot district. Locals here are found attracted to opium cultivation with the hope of getting a good return for small investment. A large section of dry land here has been turned into to illegal opium farm. The Nalgadh folks have engaged themselves in the farming of opium poppy since the past four to five years. Negligence on the part of authorities concerned to intervene in it has been blamed for its promotion, event to a commercial-level. Nahakuli, Dware, Mansiri, Banskot, Tantra, Gharanga, Rawat Gaun, Siun, Rup, Khati Gurta, and Phumda see the spread of illicit commercial opium farming. A large number of farmers are involved in it. 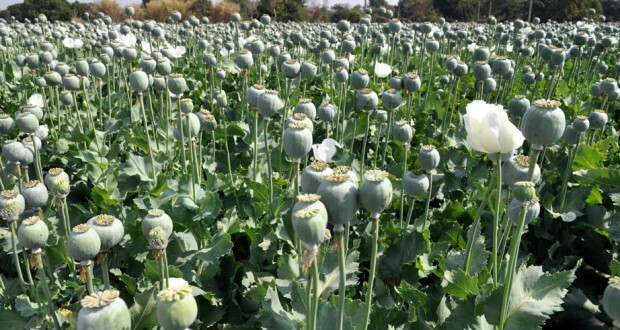 It has been revealed that farmers pocket up to Rs 500,000 for per kg of opium seeds. The supply takes place from the field. As the Nalgadh folks said opium farming pays them better than other crops though it is illegal. Cultivation on one ropani of dry land (equivalent to 5,476 sq feet) yields up to two kilogrammes of opium seeds while they hardly can make income of Rs 5,000 from cultivation of other crops. The opium cultivation takes place in September/ October and harvest season falls in April-May.